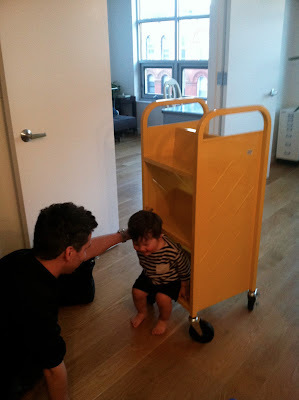 We just got a book cart from Demco for our son's room. The look of book trucks is what first drew us to them, but it's also a great design solution when you know you'll need to move things around in a room. Also, we realized the bookshelf was just the right height for our son to access all the shelves. The thing fits so many more books that I imagined. 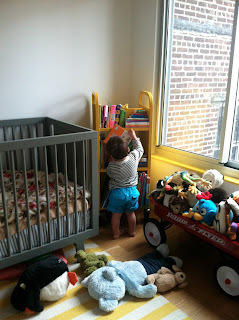 We still have a ton of books that are in Greyson's closet to put on the cart and I have no doubt we'll have plenty of room for them and room to grow, too. We bought the cart online without having ever seen it in person and I'm very pleased. I like the quality construction, the color, the size, everything. It feels really solid and I know it will last forever. I wondered if the cart would be a safety issue since it's on wheels and the first thing Greyson did when he saw the cart was sit on it and want to go for a ride. But, he hasn't climbed it or ridden it once since. I supposed it depends on each kid, but ours isn't interested in doing anything but reading the books that are on the cart. 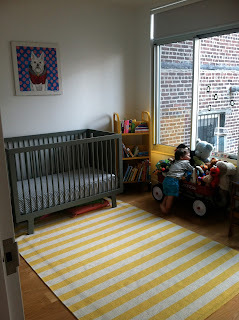 One reason we got the cart now is because we're starting to think about how our space needs will change when we have another baby in September. We want both of our kids to share a room even though we have a third bedroom. That said, we have some ideas about where we'll put a crib when the baby eventually sleeps in it and where we'll put a twin sized bed for our 21-month old son who sleeps in the crib now, but we aren't exactly sure what our space needs will be when the time actually comes to share the space. 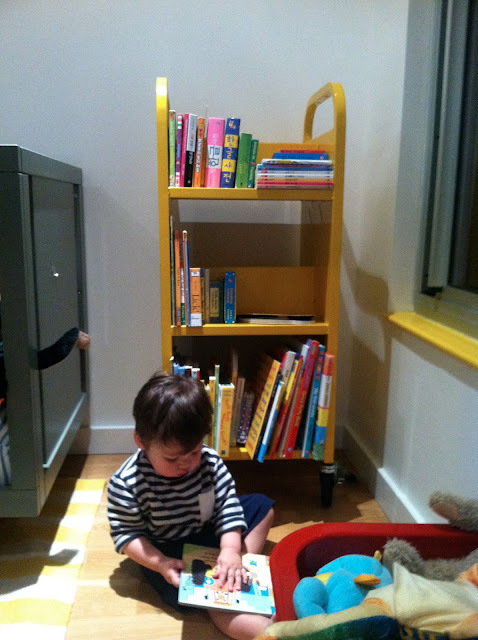 This library cart, which fits tons of books on both sides of the cart, works well in a corner of Greyson's room, but we can easily move it around to any part of the room. And if we realize we need more space in room, we can put the cart in a different part of the apartment since it doesn't look like children's furniture. Hi Mariana! I'm sorry I didn't see your comment until now! The book cart is about 15" deep and 18" wide, which doesn't seem huge, but it's a big cart. The color is totally sunshine yellow, not too bright but definitely pops. I really like the cart! Come over and check it out if you want.